We love your kid's imagination! This Halloween, they want to invent their own superhero, and they are torn between Sunshine Gal (who uses solar-powered weapons and tools to fight environmental crimes and spread positivity) or Banana Girl (who gets superhuman strength from eating bananas and rides in the Bananamobile). Hmmm. That's a tough one! Either way, you've got one smart, peppy kid on your hands. We love their outlook on life! 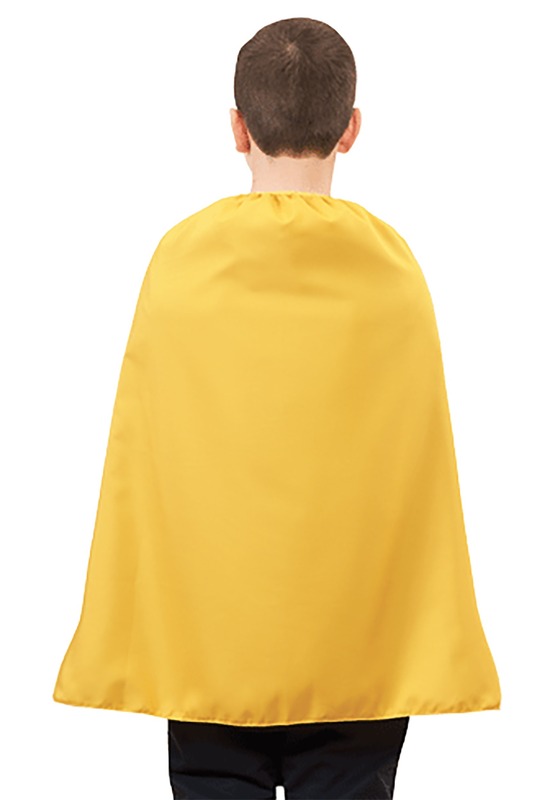 They can't go wrong with either costume, but it's clear to see that either look will require this Child's Yellow Superhero Cape as a finishing touch! Banana Girl can't be touched as she soars through the air with this neck-tying, bright yellow cape trailing behind her. Or just imagine the look on litterbugs' faces when they see Sunshine Gal land before them in this cape! Priceless! This accessory will fit most kids aged 4-12, so they can fight crime in bright style for years to come. There's no crime too big, no villain too fierce, no task too impossible for your little superhero. However they choose to style this cape, it's very important they remember not to leave home to fight crime without it!